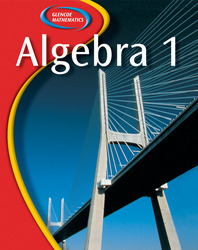 The top-selling Algebra 1 program in America, Glencoe Algebra 1 is noted for bringing math success to all students due to its many innovative features, easy-to-use technology, and top-rated Web site. Based upon proven research, Glencoe's Algebra 1, Geometry and Algebra 2 programs offer you today's leading high school series for all students. Provide students with the “big picture” of learning algebra with What You’ll Learn and Why It’s Important at the beginning of each lesson. Prepare students for algebra success before the chapter with Prerequisite Skills during the lessons with Getting Ready for the Next Lesson and then after the chapter with Study Guide and Review at the beginning of each chapter and at the end of exercise sets. Help students understand and use the language of mathematics with Reading Mathematics and Writing in Mathematics. Familiarize your students with the types of questions and formats they will see on local, state, and national tests with Preparing for Standardized Test Practice. Increase students’ access to additional algebra help with Glencoe’s extensive online resources including Self-Check Quizzes, Extra Examples, and Vocabulary Review aligned to their Glencoe Algebra 1 text.